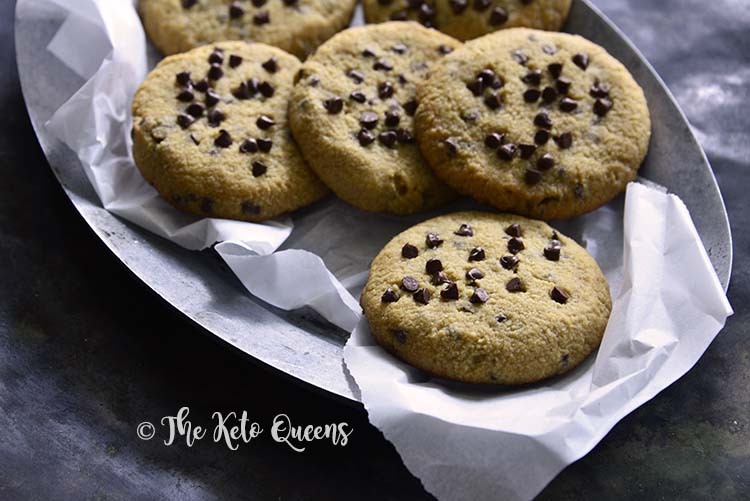 This recipe for Low Carb Keto Chewy Chocolate Chip Cookies is our best keto version of America’s sweetheart cookie; chewy texture, buttery, vanilla-scented, notes of brown sugar, and stevia-sweetened chocolate chips. Chocolate chip cookies seem to be America’s sweetheart cookie. We have yet to find someone who isn’t sweet on them! 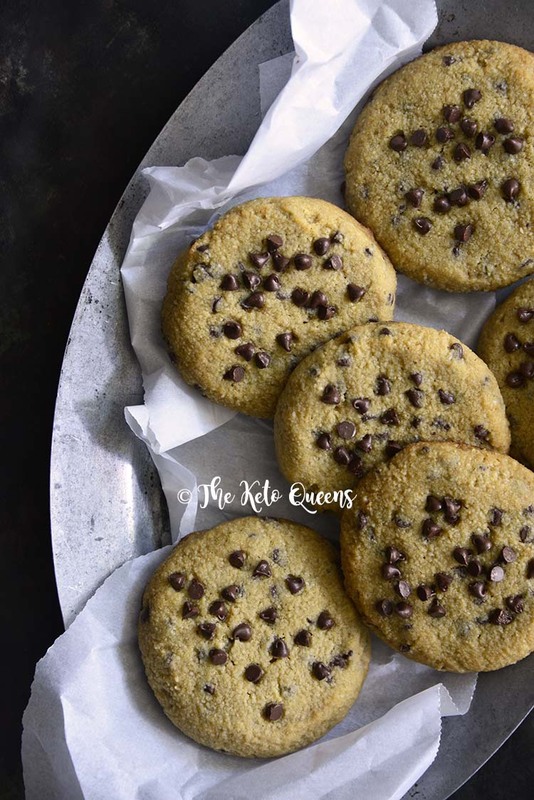 We remade everyone’s favorite into something that won’t spike your insulin and cause a sugar crash or gluten bloat later; keto definitely saved us here because there’s no way we could live without chocolate chip cookies without feeling deprived! When we were coming up with this recipe, it was important for us to keep these cookies chewy because that’s a big part of what we love so much about chocolate chippers (read below for the secret ingredient that makes these chewy!). 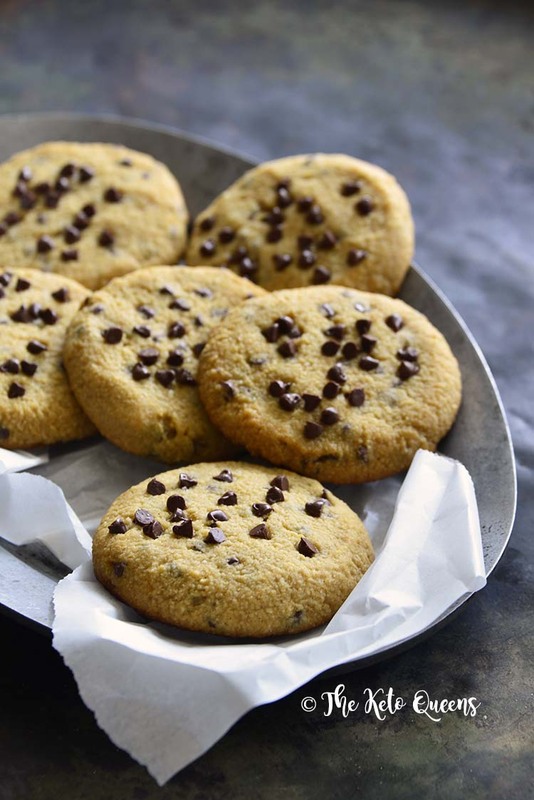 The chewy texture paired with their rich buttery flavor, faint vanilla aroma, and stevia-sweetened chocolate chips makes these cookies perfect. According to Wikipedia, American Chef Ruth Graves Wakefield and Chef Sue Bridges invented the chocolate chip cookie in 1938. During this time Ruth owned the Toll House Inn in Whitman, Massachusetts, which was a popular home cooking-type restaurant. Ruth’s “Toll House Chocolate Crunch Cookie” recipe was first published in the 1938 edition of her cookbook Toll House Tried and True Recipes, published by M. Barrows & Company. There’s actually quite a bit of science that goes into baking; a variety of factors, such as the ratio of flour to leavener, gluten content (or lack of it) in the flour, amount of eggs, moisture content of ingredients (for example, white sugar vs. brown sugar), and even the weather (temperature and humidity) all effect the outcome. And that’s just with regular baking; keto baking is a different story! For the best results with this recipe, if you make exactly 8 cookies, we recommend baking these cookies at 350F until they’re golden, about 15 minutes. We also recommend briefly chilling the dough (20 minutes in the fridge) before baking to yield the perfect texture. To keep these cookies keto, we use almond flour, which of course has no gluten. We compensate for that by adding beef gelatin to give these cookies a chewy texture (and no, don’t worry, you can’t taste it!). We like Vital Proteins brand. We use Swerve Confectioners as the sweetener in this recipe, along with just a touch of blackstrap molasses to give the cookies a deeper caramel color and slight brown sugar flavor. And of course, grass-fed butter is a huge part of the flavor of a great chocolate chip cookie, which helps add the healthy fat to make this recipe keto! Whisk together the almond flour, gelatin, baking powder, and salt in a medium bowl and set aside. Beat together the melted butter and Swerve, and then beat in the vanilla and molasses, and finally the egg. Stir the dry ingredients to the wet, and then fold in the chocolate chips. Cover the bowl and refrigerate the dough 20 minutes. Meanwhile, preheat oven to 350F; line 2 large baking sheets with parchment paper or silpat liners. Divide the dough into 8 portions and roll each into a ball. Arrange them on the baking sheets, slightly flattening each (leave quite a bit of space between each because the cookies spread out). Bake until the cookies are golden on the bottom and around the outside, about 15 minutes. Who would have known that beef gelatin would make cookies chewy! but hey they look and sound absolutely delicious! thanks for all the tips too on making the perfect chocolate chip cookies, loving the keto take on this, now I can eat cookies without getting bloated!!! As a diabetic these are the best tasting cookies I’ve had in a long time that I can have. These look great, but I have a question on the macros that I hope you can explain. You said there are 24.1 carbs and 6.3 fiber, so wouldn’t that be 18 net carbs, not 4.8? Can you help me understand how you got that? Thanks so much! These are freaking incredible. I used your link to amazon to get the beef gelatin so hopefully you received something for your time coming up with this recipe. Thank you so much! We’re glad you liked them! These look amazing! I have a question about the flour. Do you think I could substitute the Almond for Coconut flour? If so, would it be the same amount? Unfortunately you cannot. Normally you would only use 1/4 c of coconut flour for 1 cup of almond flour. Recipes don’t always translate out the best even with this substitution though. Does it have to be beef gelatin or can I use unflavored gelatin? Tammy, You mean the Knox gelatin? We haven’t tried it using something else, but we think it could work. If you try it, please let us know how it goes! It did work…they are amazing! I also used 1/2 amount of sweetener(monk fruit) and used liquid stevia. I mix to avoid cooling effect. Seems to be working. My husband said they were almost cake like….he liked them too! Thank you for the recipe! It’s a keeper!